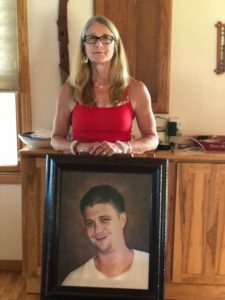 Kim Brown stands with a picture of her son, Andy, who passed away from an accidental heroin overdose. The damage done to a family when a child and sibling dies is staggering, especially when the death is caused by a drug overdose. The shame and stigma directed your way after losing a child to an overdose is quite debilitating. In any event, there were no neighbors with casseroles or offers to help and very few condolences. 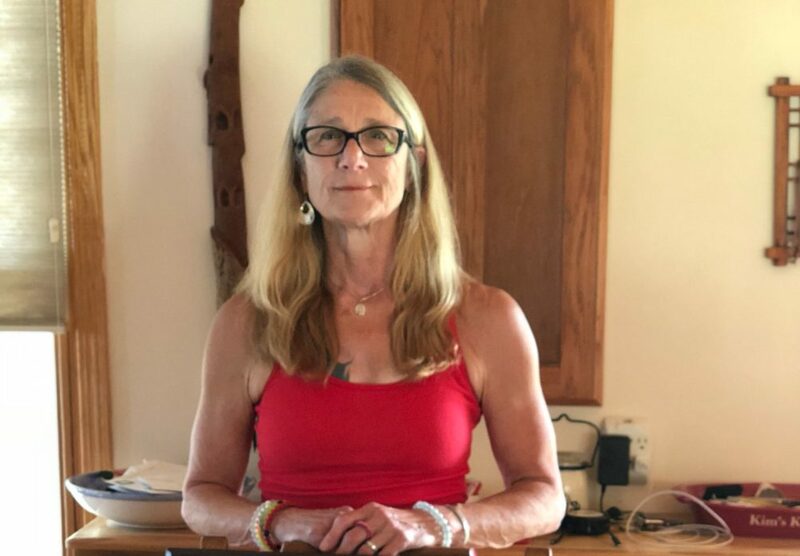 I was introduced to harm reduction when I sought support for my grief online. I discovered GRASP, Grief Recovery After A Substance Passing, and found other mothers to whom I could talk. GRASP literally saved my life. While pouring out my heart to these mothers I’d met, I was struck by their absolute certainty that our children’s deaths could have been prevented. Had we been able to access harm reduction tools, including naloxone, clean needles, and safe spaces for them, maybe our kids would still be here. With this knowledge, I began to turn my grief into advocacy. We founded QC Harm Reduction, our 501(c)3, non-profit organization in 2015, but had been seeking allies to support naloxone training and distribution since 2012. Iowa did not have a naloxone access bill, so we began to advocate for one at our state capitol. Finally, in 2016, after four grueling years, our law was passed. As we attempted to build support for training and distribution in our community, we continued to get pushback from many stakeholders. Stigma, shame, and a focus on abstinence were sadly still the rule of the day. My dear friend, a former Catholic Worker, Michael Gayman, introduced me to some folks in the faith community who operate The Center, Love in Action (LINK). They listened as I explained how a simple harm reduction tool, such as naloxone, could save the lives of people who use drugs. Our mission was well received, and they invited QC Harm Reduction to be a partner organization. As a result, we have been able to reach those directly impacted by drug use at The Center, in Davenport, Iowa, and through our street outreach. We have partnered with the homeless shelters in our community and have expanded our street outreach and services. QC Harm Reduction, in addition to distributing naloxone, now provides HIV and Hepatitis C testing, all free of charge. Unfortunately, Iowa has yet approved needle exchanges. We are working to change this. We also distribute food, clothing, backpacks, and other items necessary for survival, including, importantly, love and acceptance to those who are often discarded and forgotten. I am deeply grateful to The Center and their faith community for the love and support they’ve shown me, QCHR, and those individuals we are helping to serve. We are trying to get people to connect the dots. People on the streets are put in jail for low-level drug offenses, and they are often parents. This is disrupting the lives of children and families, and the human costs are too great. The Center and QCHR believe strongly that harm reduction is a human right and that everyone is entitled to safety and compassion. Love is love. Every life is worth saving.